It is very easy to distill the essential oils from our local North American Pine, Spruce and Fir tree saps ourselves, but, to fully capture the exquisite qualities this type of small-scale distillation can offer us, a different approach and perspective is called for. Everything leading up to the distillation is as important to the quality of our oils as the physical process of distillation. The approach is simple. We have to shift our perspective from being product oriented to relationship oriented. From getting to giving, and change our role of consumers to that of stewards. We each exist in a relationship with nature, the planet, and much more than is visible to the eye. We are part of a vast dynamic living matrix linking and coordinating all life in its many forms, from beyond the planets and stars to the very atoms within all things. Severed from it but for a moment we would cease to exist. Literally. I know, it’s a big statement to open with, but for now, keep an open mind, and I will I will try to keep this to one post of readable length, and address these concepts in upcoming posts. We have put a lot of stress on the planet’s systems the past few hundred years. We have excelled at taking and making, and most definitely gained a lot. We have progressed and evolved as a civilization. As we see the negative impact on the health of the planet and our bodies, we struggle to understand what we are doing wrong. Skyrocketing cancers and other diseases. What are we missing? How can we do this differently so nature thrives along with us? Lucky for us Nature sees us as part of her, not the enemy, or we would have been disposed of and reabsorbed into the planet a long time ago. Dominant species or not, our behaviour has been abhorrent towards each other and the planet. Dominant Shmominant. We have intellectualized our role here, separating ourselves from nature as beings superior to all others. 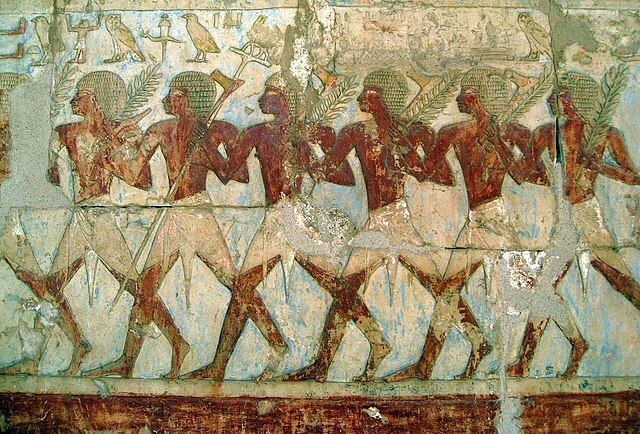 Crowned ourselves kings of the planet without assuming the responsibilities of rulership. 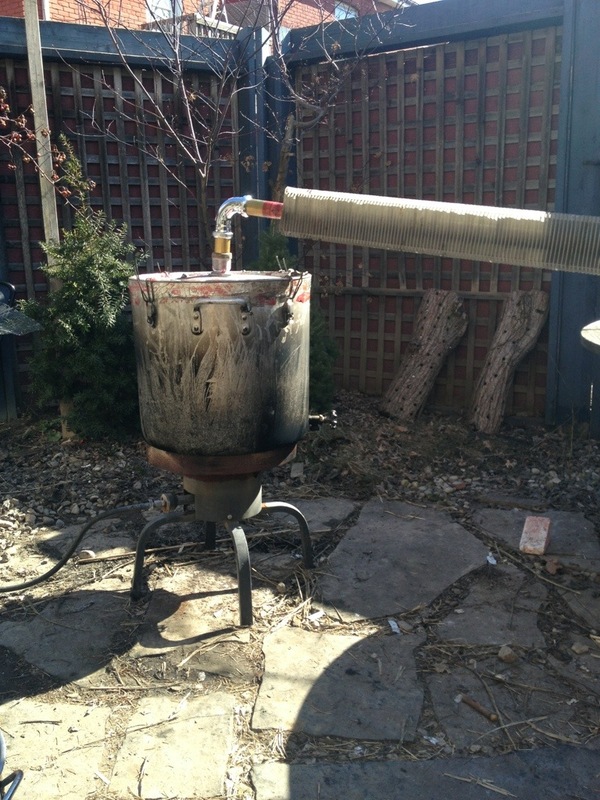 Simple homemade multipurpose pot still with air-cooled condenser. Th metal sleeve on left, is added to the top of the still for steam distillation of suspended material. Also makes a mean Grappa if it is legal where you live…. Though more sophisticated methods areinvented daily, let’s hope, ethics and sustainability are an important part of them. Needles, smaller branches and twigs can be mindfully trimmed, sent through a “mulcher”, then hydro/steam distilled. This is done easily in a home-made pot still. 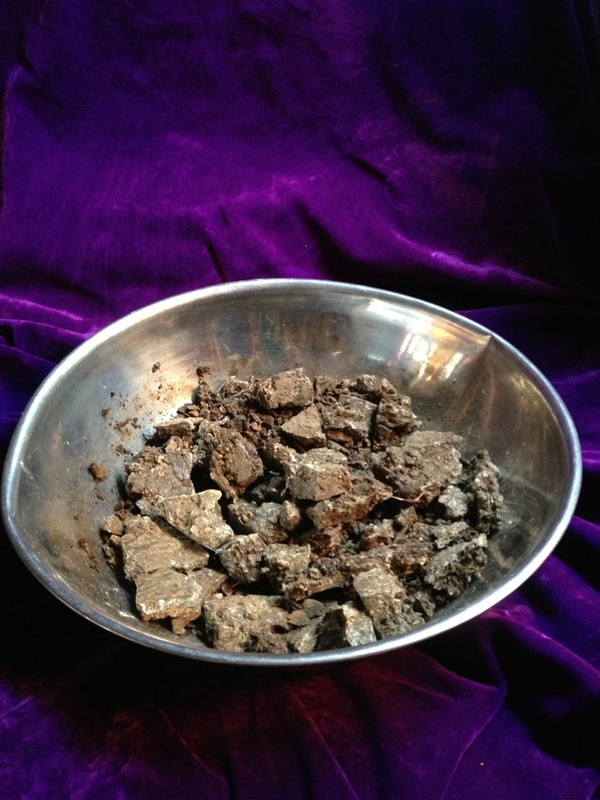 (See the post on distilling Frankincense). 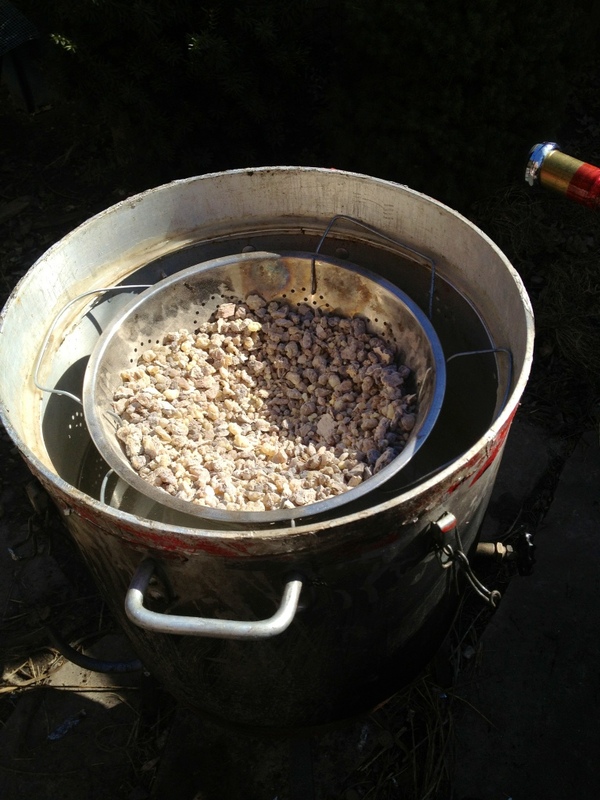 The chopped material will float on the water in the pot, avoiding the danger of material burning on the bottom. This allows us to distill the essential oils of evergreens that do not exude their saps such as White Cedar and the Junipers. They can also be set atop the boiling still pot and steam distilled. The trees can be tapped, and the essential oils distilled from their sap in a process similar to the preparation of Maple syrup. 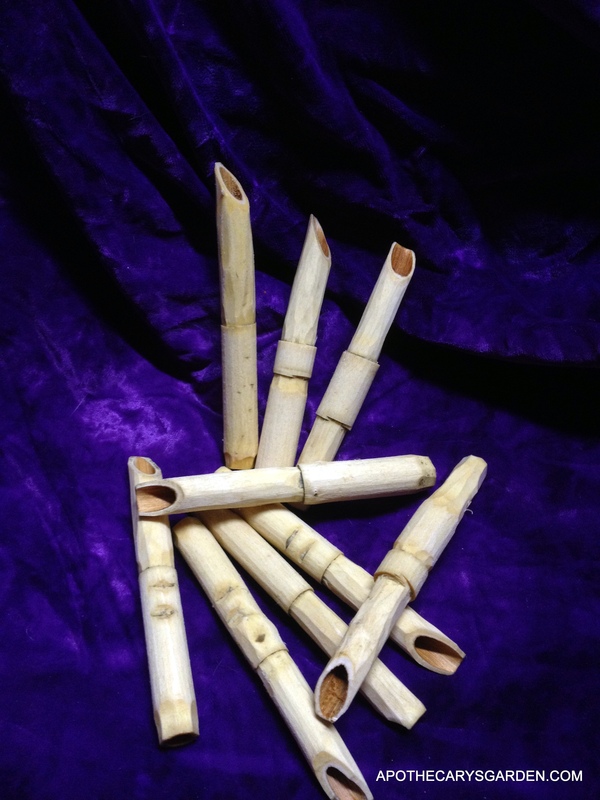 (Tapping spiles can be purchased, (Stainless steel), or made from Elder branches as these shown below). If I had a choice between a cold metal tube, or a body temperature tube made of the same material as my body, inserted into me, I know which I would choose. 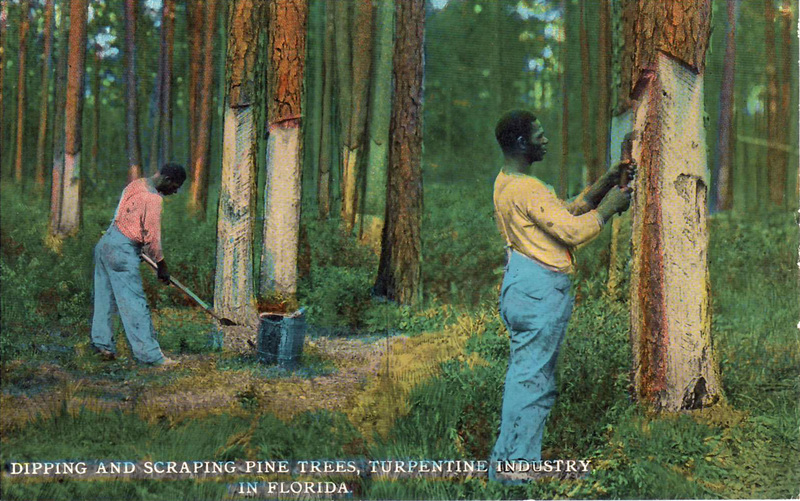 In the turpentine industry, Pine bark is cut, stripped or slashed, using methods similar to the extraction methods of Frankincense and Myrrh trees. The ensuing exudate of oleoresin, (essential oils and resins), collected and processed in copper stills. 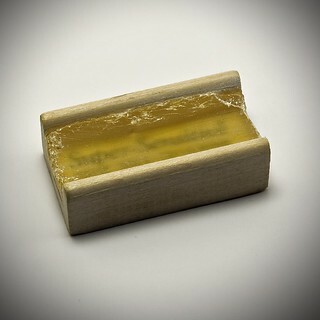 The vapours from the heated oleoresins are condensed for turpentine and essential oils, while the leftover resin is drained and filtered to make the rosin we use on the bows of violins and other stringed instruments, and other applications where increased friction and contact is needed. With a little love and ingenuity, you can make your own beautiful crystal clear amber Rosin from Pine, Spruce or Fir saps. You can get creative and cast this rosin in any shape you can envision. It makes a lovely incense even after separation from its essential oils. By far the simplest and gentlest method for distilling essential oils from local conifers, especially if one lives in the city, is from the sap already present from the trimming of lower branches. This requires no further damage to the trees, while giving us the opportunity to produce our own exquisite essential oils and rosins for perfume, medicine and many other products. Even in the middle of the city, you will find a connection to the trees that grow in your sphere. I would say you already have a relationship with them whether you recognize it or not. To notice a tree, acknowledges the existence of a relationship between you. Life is full of subtle truths. The quality of that relationship is mostly in your hands. The quality of the products you make with the trees in your sphere is completely in your hands. A little piece of the planet’s well-being is yours to watch over and nurture. These are the seeds of stewardship. Today some large-scale operations distill essential oils from pulp, sawdust and foliage left over from milling and processing trees for lumber and paper industries. The quality of the essential oils produced by these large industries can not compare to those you can distill in small quantities on your own. The chemical and fragrance industry is vast, and many of these factory produced essential oils, especially those distilled from coniferous trees are used as starting materials for other chemicals and essential oils utilized in our everyday products. 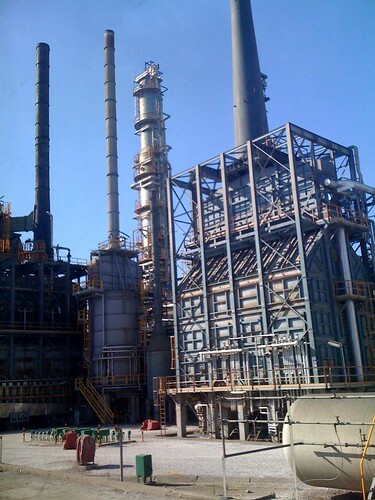 distillation column-I don’t know what they are distilling, but it gives us an idea of the huge scale of these industrial operations. On the bright side, Small scale “Artisan” Distillers of essential oils, made from hand collected plant materials, by craftspeople that have personal and intimate relationships with their local flora, people who practice ethical and sustainable methods due to their philosophies and convictions, are becoming recognized in commerce. They are increasingly in demand by “bespoke” and small-scale perfumers, naturopaths and alternative healers around the world. This, I believe, is how change on a global scale is slowly unfolding. We need these small-scale producers and artisans in as many fields as possible, and we need to support them whenever, wherever and however possible. They represent a new paradigm and model of how we can live in harmony and balance with the planet instead of our current destructive model of impersonal mass production which is taking a growing toll on our health and wellbeing , and that of the planet. Small scale farmers, conscientious and ethical animal husbandry operations, local dairy and artisan cheese producers, private-label vineyards and cottage industries, ethical wildcrafting homesteads and collectives, and small-scale distillers, all allow this type of rich, intimate, respectful relationship with nature to flourish. Supporting them enriches our communities, nurtures an ethical and sustainable relationship with the planet and provides us with high quality products that help reintegrate us on an individual and societal level with nature. They are the vanguard of change and evolution. 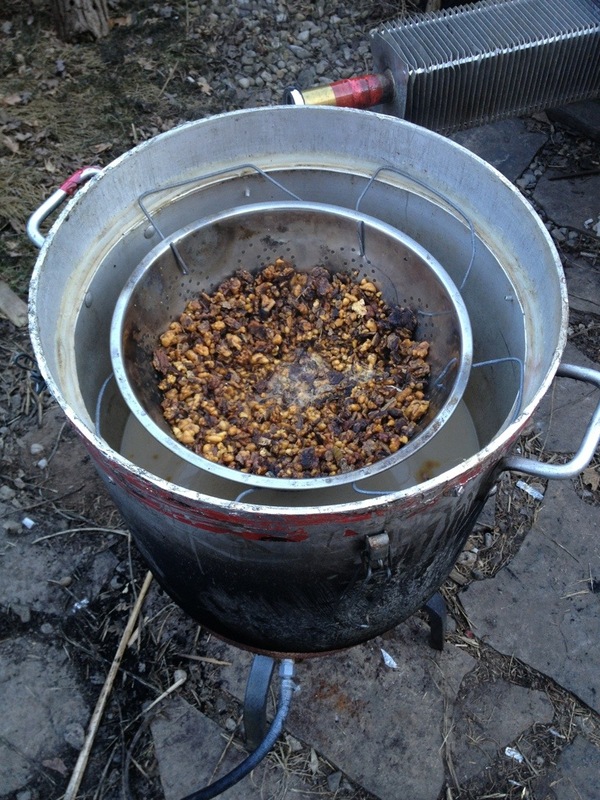 Distilling essential oils from tree sap. An opportunity for Stewardship. As mentioned above there are 3 materials we can extract essential oils from in a non destructive and responsible way. Sap collected from the exterior of the trees. I am going to focus on the external sap we can collect. If there is interest, leave a comment below, I will write about the other methods in future posts. One obvious difference is that we are working with a very specific product the tree has produced in response to an injury. One can safely assume this is not the regular sap that flows within the tree due to the unique role of these self-produced “Bandages”. These oleoresins are exuded by the tree as a barrier against opportunistic organisms and microorganisms, and to heal an injury to itself. Their composition differs from the essential oils distilled from the tapped tree and from the needles. They are higher in resins, and in my opinion, the essential oils they yield, are richer and more complex in fragrance. For this reason, it is thought, that these saps and their essential oils have a greater healing potential, and are especially suited to managing skin ailments, aging skin, wrinkles and scarring. Healing our own “bark”. The affinity is obvious. The Pinenes in these saps are considered anti inflammatory and broad spectrum antibiotics. They open bronchial passages, stimulate surface blood flow, stimulate brain function and memory. These are only a few of the therapeutic properties and beneficial traits they offer us. 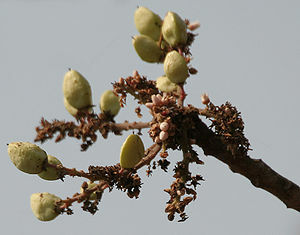 Learn to differentiate between the different species and types of trees. Always collect and distill Pine, Spruce and Fir sap separately. If you like, you can start by collecting unidentified Pine, Spruce and Fir saps, and distill a more generic essential oil from each tree type, until you can discern between them. For most medicinal purposes this works well. If you invest some time in study, you will learn to tell the difference between the various species in each of these families. Your relationships with the trees will grow and deepen, leading you to consistent and higher quality essential oils. This is a craft and an art that calls for mastery. A simple way to tell the difference between the three families, is that pine needles are “almost always” multiple, and are joined at the base in a sheath. Spruce and Fir needles are attached to the branch individually, a Spruce needle will roll easily between thumb and forefinger, while a Fir needle is flat and will not roll. Spruce needles are often more rigid and have sharp skin penetrating tips, Fir needles are softer. Spruce cones grow downward while Fir, as far as I know has upward growing cones that do not last the whole season. Someone once said “Loving someone is knowing them”. It is so with Nature, you will find that love and knowledge will grow hand in hand. We raise our children detached from Nature. Shamans, elders, Priests and priestesses, medicine men and women, those who have traditionally kept the spirit and connection with nature alive in our communities, have lost their roles in modern society. It is up to us to address this void. There is no one else. Our natural “resources” are much more than just chemical compounds we can take and process into useful products, there is a unique life force within each plant, animal and mineral woven through the universe. Can we keep this energetic vitality alive from harvest to finished product? The laws of Nature, Physics and Karma work flawlessly, whether we can see them or not. For every action there is a reaction, no energy invested ever disappears, and we reap what we sow. There is an intelligence of Nature that exists everywhere around us. Just because we have not yet invented the instruments to measure it, does not mean it does not exist or does not react to every action we impose upon it. More than this, we are innately and intimately involved in this dance, as individuals and societies. The intelligence of trees, and those intelligences that take care of our trees and woods and every other individual species in plant, animal and mineral world exist to my satisfaction. We too are part of this living tapestry, regardless of all attempts to intellectualize our superiority, and see ourselves as separate from the rest of life on the planet. Do no harm, should be in the forefront of our minds whatever we occupy ourselves with. Especially with Nature. And if you can help out natures citizens while you are out in the woods, it is important you do so. There is no better use or service for our so-called “superior intellects”. The beginning of all endeavours starts with our intent. What is your vision? The laws of nature and physics dictate you will receive as you give. As in many aboriginal traditions we communicate our intent, listen carefully, and give before we take. Nature isn’t picky about what you give. Lucky for us She is not hung up on material things. Learn to listen to Nature and to yourself. Just as in any important relationship. There are no coincidences. Nurture your relationships. Secrets are never shouted. They are whispered. Be quiet and still, and Nature can teach you everything you need to know. Let it be a devotion. Deepen your relationships with the plants you engage, develop your own personal ethics, and methods of sustainable and mutually beneficial harvesting in the wild. Engage with the spirit of your harvest, respond to their needs there is much more to be reaped than meets the eye. Our Northern American evergreens have been suffering from an infestation of Borers that have decimated huge tracts of our forests. I always carry a long wire with me when I harvest sap. Whenever I see a hole under a patch of sap, I insert the wire to the depth of the hole, and destroy the grub therein. Not a planet saving move on its own, but if we all held the well being of the trees and all nature’s citizens in mind while we were taking what we wanted from them, it would, I believe, make a difference. Not only in the world, but in the products we create from nature. 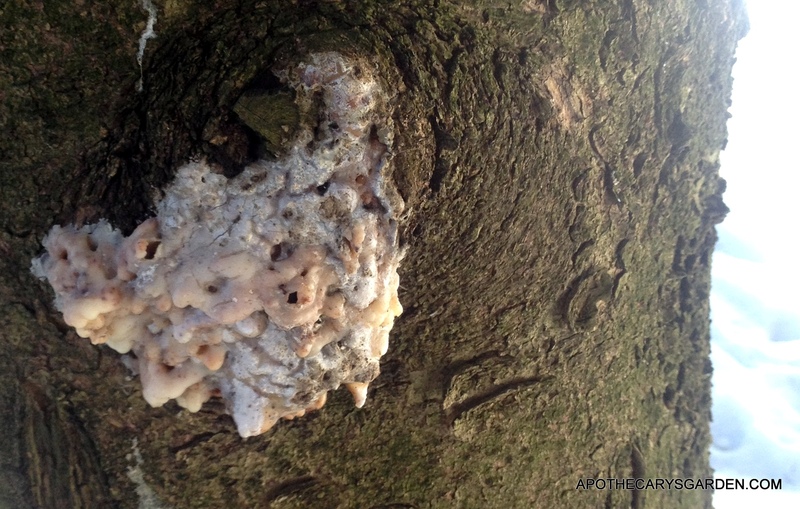 In the winter the tree is dormant, the cold weather inhibits the growth of organisms and micro organisms that could attack an exposed area of the tree. This is when it is ideal to harvest our sap. Try not to scrape the sap down to the bare wood. There is plenty for you and the tree. If you get ahead of me, and try to distill these saps before the next post, please be very careful! They are extremely volatile! 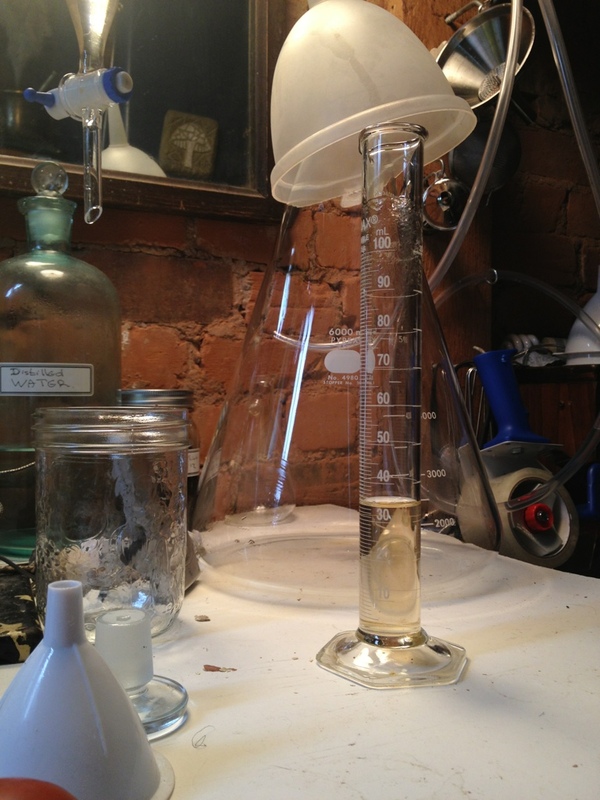 Keep vapours away from open flames and perform a hydro or steam distillation. Don’t heat the saps directly! This is all for now. Part 2 will address a bit more of how to harvest and the distillation process. I could not in good conscience, write a post about distilling from the wild, without first laying down some clear directions for ethical and sustainable wildcrafting. I apologize for the length and any excess meandering. It is obvious where my passion lies. I would feel terrible if I found that someone was hacking at trees after reading this post. 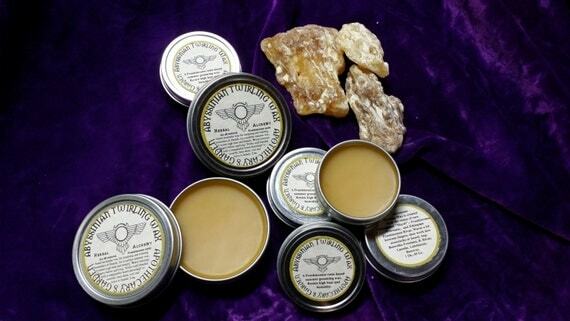 Especially with that disturbing photo of turpentine collection…. If you do not have these trees in your area, or if you would like to buy ethically and sustainably harvested saps from someone who is passionately involved with the ethics and sustainability of wildcrafting, I have some beautiful fresh White Pine and Spruce saps for sale in my Etsy store. Click on the photo below or any of the Etsy badges in the sidebar to find out more. Disclaimer- This post does in no way imply one should harvest from city or private property, or if in the Hamilton/Burlington area, stray from the marked trails on RBG property. 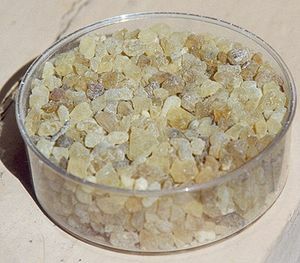 The oleo-gum-resin for this distillation is Frankincense from Ethiopia. Because this is an experiment I only used 2 kg. of resin. Much less than this still can process. 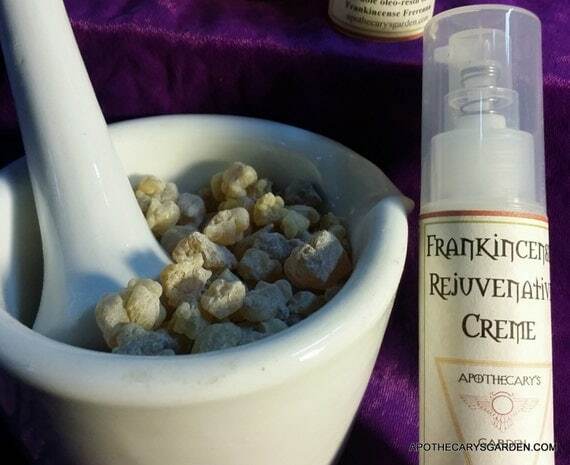 The ratio of essential oils in each type of Frankincense varies greatly. One can collect anywhere from 10 ml. up to 60 ml. or more from 2 kg. of raw oleo-gum-resin.